As a Transition Coach I believe, in self-help, personal growth, coping with grief, coping with loss and healing. I believe, “Kindness matters for our self growth, it helps us heal.”-Wendy Comeau. There is always a solution to every conflict. The most important thing is to listen, really listen to what is not said. Listen with an open heart, without judgment. When looking for a solution, when in conflict show kindness, understanding and be willing to understand with an open heart. In every challenge you will find a new opportunity and sometimes even a friend, because you chose to listen without judgment. Wendy Comeau is a Registered Social Service Worker and a Certified Coach Practitioner. She lives in Toronto, Ontario, Canada with her husband Robert, where they spend time discovering new places in the city and venture out to explore parks, nature trails, art stores, restaurants and music venues. She is grateful for the simple things life offers, such as getting up early to watch the sunrise, long walks on the beach, being outdoors and living in the moment. A Heart of Kindness by Wendy Comeau is a memorable and remarkable story of survival in the face of tragedy. Wendy opens her heart and tells her story of facing life after the heartbreaking loss of her parents, brothers and then young son Christopher to Batten Disease. Follow her journey as she learns not only how to face the future, but learns how to embrace life with joy once more. Facing life’s obstacles is never easy, whether it is the loss of a loved one, a relationship or job. You can either lose all hope or learn how to recognize that there is a life lesson to learn with every adversity. Throughout this book you will discover that change is inevitable and beneficial, the importance of treasuring moments with friends and loved ones, and the knowledge that you alone hold the keys to your happiness. Healing begins with the first step and Wendy’s story of triumph will guide you through the haze of grief, and towards the path of self-acceptance and happiness. The author has filled this well written book with so many useful coping mechanisms and techniques to survive the uphill struggle of life. It is such a powerful guide for anyone who has lost direction in life and needs to get back on track. Although this is Wendy's story, the techniques she shares can help anyone overcome grief and inspire change from negative to positive. I loved the pictures of Christopher at the end of the book; his zest for life and lack of self-pity are a true testament to his amazing character. There are many ah-ha moments throughout this book; the best for me was the analogy of walking through storms and reflecting on and appreciating what you have been through. I also discovered the importance of appreciation of family, not judging others and giving back to the community. This quote from the book sums up this amazing inspirational story for me: "Patience, persistence, and focus are important. Imagine life is a garden. What would you like to grow? A great job or business? A happy relationship? Children? Special goals and dreams? Planting idea seeds can start the process. Your action and energy will do the rest.” Marta Davidovich Ockuly (2017). Life begins with kindness from the heart and it ends with the people with the kindest hearts. 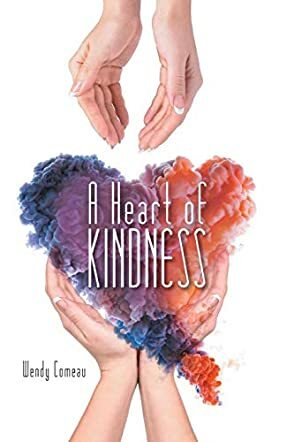 A Heart of Kindness by Wendy Comeau is an uplifting book that will help readers understand life and its nuances, new beginnings, opportunities, and challenges. This book will also help readers understand the power of kindness, and how there is always hope for a better tomorrow. The courageous story of the author, from losing her son, Christopher, to Batten disease, a neuro-degenerative brain disease, to that of losing other family members to learning to live again will encourage readers to heal, have hope and faith, and show compassion and kindness to others during their times of despair. The author’s story of moving on from her pain and sorrow, and learning to live all over again will give readers hope and help them accept life in spite of its tragedies and adversities. The book is honest and the author’s personal stories will help readers change their views on life and living. Her words will make everyone face their challenges, despite having many obstacles. Life is good and life will go on is something that readers will understand by the time they finish reading this book. A Heart of Kindness is about courage, resilience, hope, healing, and moving forward despite being broken, and many readers will be able to connect with the author’s pain and make positive changes in their outlook towards life. A Heart of Kindness is well written and that makes the author’s grief and pain tangible to readers. There are a lot of insightful messages in the book which are simple and can be incorporated into life easily by everyone. Anyone who has known the pain of deep grief will find solace in the nonfiction work, A Heart of Kindness, written by Wendy Comeau. Wendy experienced the deaths of her parents and two brothers – and the most heartbreaking one, her son Christopher. At the age of fifteen, Christopher was diagnosed with a rare disease called Batten Disease CNL1, a neuro-degenerative brain disease. While the next ten years of his life were fraught with loss, he shared words of wisdom with his family. After his death, Wendy describes her path to healing. She discovered that healing her heart was the most essential aspect, stating “a heart of kindness began within me.” She also found comfort with her husband Robert and daughter Jennifer, as each struggled to find peace. This is a book of lovely reflections; it includes many quotes from famous persons, poems, and Christopher’s own insightful writings. Including some poignant photographs of Christopher and the family adds a realistic aspect to this book. Author and mother, Wendy Comeau shares her story of healing her broken heart in A Heart of Kindness. Wendy had been a stay-at-home mother for over twenty years and wanted to find a place for herself in the world. She returned to school and became a Social Service Worker, and forging a life of service may be one of the most important facets of her healing journey. Her reflections on such topics as forgiveness and gratitude hold life lessons for all people struggling with life’s difficulties. This is an uplifting book, full of hope and promise.